Jordan Henry's physicality was on display on Tuesday night against Vancouver. CALGARY, AB -- If you asked hockey pundits in the summer what the Calgary Flames blueline would look like on Oct. 8, they probably would have scoffed and told you it was a no-brainer. Mark Giordano, Scott Hannan, Chris Butler, Jay Bouwmeester, Cory Sarich and Anton Babchuk would have been listed as the top six guys in the defence corps. Brett Carson, who signed a one-way deal with the club in the summer, would likely have slotted into the seventh d-man position. Now, a week into training camp, that is suddenly up in the air. Sarich (pelvis) and Carson (back) have both been hampered with injuries and likely will not be ready to suit up come early October. Sarich has been skating in the groups but has been wearing the yellow no-contact jersey. Carson hasn't joined in group practices yet. TJ Brodie, Chris Breen and Brendan Mikkelson haven't shown enough in early preseason performances to be considered shoo-in's for a roster spot. John Negrin has already been assigned to the Abbotsford Heat. However, amidst this uncertainty, one blueliner has stood out with his steady play. It might just be Jordan Henry's time. Acquired in the off-season when the Flames swapped rearguards with the Florida Panthers - 23 year-old Keith Seabrook went to the Sunshine State - and while it appeared the Strathmore, AB native was likely headed to Abbotsford in Seabrook's place, he's right in the mix to snag a roster spot. "My goal coming into this camp was to make the team," the 25 year-old said. "One game in, I'm feeling comfortable. I just need to focus on my own game." 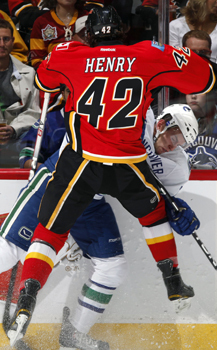 Standing 6-foot-2 and weighing in at 198 lbs, Henry has provided the Flames with a big-bodied, physical defenceman who moves the puck well. His focus is on his defensive game but he is very willing to jump into the rush if an opportunity presents itself. His performance on Tuesday's 5-1 win over the Vancouver Canucks showcased his two-way game perfectly. While in his own end, you could barely notice Henry and that is a good thing. He held the Canucks to the perimeter, used his stick well and made quick work of defusing any potential offensive strikes by Vancouver. When he entered the offensive zone, your eyes were drawn to him. He either went steaming in on the rush or was roaming the opposition's blueline, looking for a pass in hopes of sending a blast from point. However, the Canucks roster on Tuesday night could be described as a bare-bones when it comes to the number of NHL-ready players they sent to Calgary. As the preseason rolls on, he'll be faced with tougher competition and will need to continually elevate his game. "Every night is audition and there are a lot of good d-men out here," he said. "We've got a lot of young guys that can play. If I take care of my job and play well, I think I've got as good a chance as anyone." Henry spent the 2010-11 season in the KHL with Minsk Dynamo. In 36 games, he scored one goal and two points while adjusting to higher level of competition than he faced in the AHL. His time in Russia improved his mobility, defensive awareness and overall skill level. "There's a lot of highly skilled, quick guys over there and they spread the ice out very well. It definitely helped my skating a lot. Hopefully I can bring that back with me and use it here on the smaller ice." His time in the KHL is going to come in handy this weekend when the Flames play back-to-back games against the Edmonton Oilers. The kids up north are speedy, skilled and hungry to show that they belong in the NHL. Henry is going to be counted on to shutdown the offensive-minded rookies from Edmonton and he knows exactly what he needs to show the coaching staff and management. "That I can execute consistently at this level," he said. "The first game was a step but you've got to step your game up the next time you play. I have to be able to go out there every shift and do my job and look like I fit in out there."